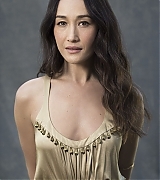 Welcome to Maggie Q Online, your number one source for all things Maggie Q. She is best known for her roles in several films such as Mission: Impossible III, Live Free or Die Hard, the Divergent film series, and in television shows such as Nikita and Stalker. 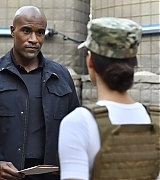 She currently stars as FBI Agent Hannah Wells in the new ABC show, Designated Survivor. Thanks for stopping by, and please visit us again soon! Maggie is an avid support of Best Friends Animal Society so please take a moment to check this wonderful charity out. Make sure to follow the site twitter to be up to date on all of the latest news and going-ons from the site. The Hollywood Reporter listed their 33 top supporting contenders for this year’s Emmy Awards, and Maggie is one of them! Check out the special photo session they did, and their short interview with Maggie. Favorite TV show as a teen? Reruns of Wonder Woman, because I was besotted by Lynda Carter. It was probably the scene where I find out that the death of my mentor has happened. There was just a particular approach I wanted to take with it, because it’s different than just someone you love, or somebody you’re close to. I think it might’ve been, not current Leo DiCaprio, but Growing PainsDiCaprio. I think that’s probably what it was. I think for movies it was Ralph Macchio. It wasn’t a female, weirdly enough, because I think [some might] see a female onscreen and think, “Oh, I want to be like her.” Besides Lynda Carter — who I thought was the craziest, bravest woman onscreen at the time — it actually was a film that I saw when I was young. It was called The Killing Fields, and it was John Malkovich and Julian Sands. My mom is an immigrant, and it was a sort of story about what happened during [the Vietnam War in Cambodia] and how people were able to leave. And that to me, [Haing Ngor, who won the best supporting actor Oscar for his portrayal of Cambodian refugee Dith Pran], to be able to portray what my family went through, made me realize that emotions are the great equalizer with us. It doesn’t matter whether it’s a man or a woman, if somebody can give you the idea and the feeling of what happened to your family and their past, that is a huge gift, and that affected me profoundly. Maggie goes bold in the new ad campaign for PETA. She shared with Yahoo Entertainment that she came up with the concept for this shoot. If there are any fur products on your holiday shopping list — even the tiniest bit of trim — this photo of Maggie Q should make you rethink them. The Designated Survivor star and Nikita alum appears in a bold new campaign for PETA — the kind that leaves a lasting impression as she clutches a bloody dead rabbit in one hand. The point of the ad — which reads “Here’s the rest of your fur trim” — is to serve as a reminder this Black Friday and holiday gift-giving season that animals are electrocuted, drowned, beaten, and often skinned alive to have their fur removed. And, yes, that includes the tiny bits of fur trim on clothes and accessories. The campaign launched in Asia, and this is your first look at the English version. PETA is known for its shocking images, but Maggie — a passionate animal-rights advocate who also works with WildAid and Best Friends Animal Society in Los Angeles — tells Yahoo Entertainment that she came up with the concept for the shoot, a collaboration with fashion photographer Greg Kadel, after being fed up with all the fur she had been seeing. While Maggie doesn’t wear fur and that’s known to the people she works with, she says people still try to get her to wear it when it’s an accent on an article of clothing. Needless to say, it’s exasperating. I’ve finally added 30 HQ portraits of Maggie taken during the Summer TCA Tour last week. Huge thanks to the guys at Far, Far Away for the pics! My awesome friend Renee sent me this new Peta ad. Enjoy! I’d rather work in a group than work solo. I like both. But if I said I’d rather work by myself, that would be a lie, because filming a TV show requires a team effort. I’d rather surf the ocean than the Internet. I’m from Hawaii. I grew up surfing, and my connection to the ocean is profound. I go back to Hawaii when I get more than a week off, which isn’t all that often, sadly. I’d rather do my own stunts than have a stunt double. I do my own stunts and I hurt myself all the time. I’m lucky that it hasn’t been too bad. I’ve cracked bones. I broke my fingers last year while shooting Nikita. It wasn’t even an action script. I was supposed to lift up a metal grate and climb down a ladder that led to an underground tunnel system. The grate teetered and fell on my head and my hand. I couldn’t hold onto the ladder and fell. It was awful. I went to the E.R. but I showed up to work the next day. I’d rather wear sweats than a ball gown. The best thing about a gown is that you get to go home and put sweats on. When I’m shooting, I have to deal with a million people, so in my off time I’m pretty solitary. I keep it low-key and quiet. I do yoga, read, and hang out with my dogs. I’d rather be lied about than lied to. It already happens every day and it’s not a big deal. Those are the people I don’t know and who don’t know me. Being lied to implies we’re close, and that would hurt more. I’d rather fight alongside Linda Hamilton than Sylvester Stallone. She’s a badass. Remember that photo of her in the black tank top and military pants from Terminator 2? She was “it” at that time. I loved her. I’d rather talk to animals than be telekinetic. I already have this deep connection with animals, so I’d take it to the next level. I’ve been an activist for 15 years and worked with a lot of different animal groups protecting everything from cats and dogs to elephants, bears, and marine animals. I love them all. I’d rather date a sensitive guy than a tough guy. I always say a tough guy, and people get put into a box, so it would be nice to try the other side. Nikita airs Fridays at 8 p.m. on the CW. With many thanks to the lovely Marica, I’ve updated the gallery with outtakes of Maggie from a shoot for TV Guide at Comic-Con last year as well as an additional photo from her New York Magazine editorial in 2010. Be sure to check them out.